Description: Restrictions apply on high capacity magazines in several areas of the United States, so please read this entire ad carefully. We have compliant magazines available for shoppers who live in juridictions where these 16 rounders are restricted. This listing is for ONE Magazine. Buy 3, or combine any 3 non gun non ammo items, and shipping is Free on the entire order, lower 48. Here are magazines to fit 99 series pistols manufactured first by Walther, then by Smith & Wesson, and then by Desert Eagle company Magnum Research. 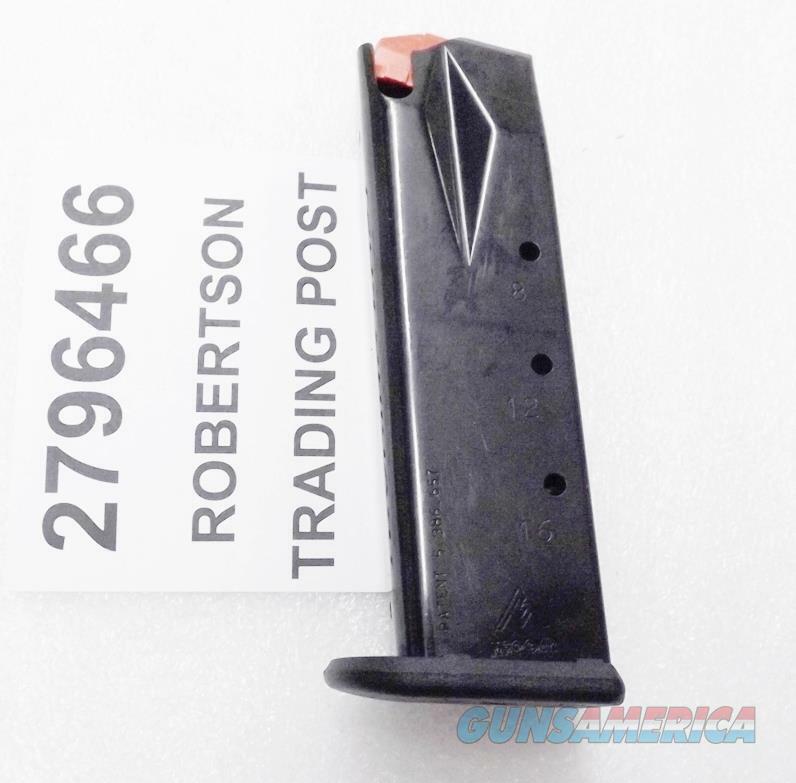 These magazines fit Smith & Wesson models SW99, SW99QA, and SW990L pistols in 9mm. They fit Walther P99 and all its variants in 9mm, including P99AS, P99QA, P99ASA, and P990. The Magnum Research Company’s MR9 Fast Action Baby Eagle is the same pistol. Manufacturer is Mec-Gar s.r.l. of Gussago Italy, under license to Carl Walther of Ulm, Germany. Mec-Gar is the manufacturer of the magazine for all three companies’ pistols. This particular group of magazines were NOT imported by Walther USA, and were never in Houlton, Maine or in Fort Smith, Arkansas. These are factory Walther magazines from Germany. Construction is one piece folded steel body, with full length smooth milled welded back, steel music wire spring, and polymer tail piece and cartridge follower. Finish is polished surface blued steel, and black and orange polymer.. Each magazine holds 16 rounds of 9mm Luger caliber ammunition – 9mm Parabellum, 9x19, call it what you will, THE 9mm. These magazines will Not fit any Smith & Wesson SW9 Sigma series pistols. They will not fit a Walther P88 or PPX Pistol. They will not fit any Baby Eagle pistol. They will only fit 99 series Walthers, Smith & Wesson made Walthers, or Magnum Research Walther clones. All these magazines come well lubricated in sealed plastic wrappers, but no other packaging. Replacement pricing for their nearly identical mates is $42 apiece on waltherarms com. We’re offering them each, however,	for only	$ 17.00. Not for sale to civilian residents of Aurora IL, California, Chicago Cook County IL, Colorado, Connecticut, District of Colombia, Hawaii, Maryland, Massachusetts, New Jersey, or New York. >>>>>>>>>>>>>>>>>>>>>>>>>>>>>>>>>>>>>>>>>>Grips, Magazines, Slings, Holsters, Scopes, Mounts, Parts,buy any 3 items and get Free Shipping! Guns and ammo excluded. Lower 48 only. Live checkout orders that qualify will have the shipping fee removed before the order is charged.USPS Pririty Mail Single items non gun non ammo, flat $10.Lower 48. $20 Flat Fee any shipment to Alaska, Hawaii, or Puerto Rico.Magazines, small light non-gun items ride free with ammo or gun orders. Checks OK, 7 day hold. Website Orders,, MC, Visa, Discover phone- or fax-in 7 3 1 9 8 9 4 7 2 3 orders, USPS Money Order items shipped ASAP please put your full information, item number, and what the item is on any messages. Phone hours8:00 - 430 CST Mon - Fri. Robertson Trading Post 117 Front Street PO Box 365 Henderson, Tennessee 38340. We buy, sell, and trade. Always have, since 1952.